It’s been a while since we posted an Android update, so here’s what I reckon are the current Top 10 Essential Android Apps. Everyone will have their own personal favourites, but these ten apps are what I recommend any new Android user should check out first. Sywpe is absolutely essential for any keyboard-less Android device, such as my HTC Desire (which finally received the 2.2 Froyo update today: thanks T-Mobile!) It took me a while to finally take the plunge and ditch my “must have a keyboard” stance (having previously owned the G1 and Motorola Milestone), but now that I have there’s no going back. Swype replaces the regular tap-tap-tap virtual keyboard with one that you draw or swipe your finger around to spell out a word. It takes a few hour practice to get used to, but once you’ve mastered it Swype lets you type with considerable speed. It includes predictive technology and word-learning capabilities, handy for non-dictionary terms and email addresses. Swype is not yet in the Android Market: you need to sign up for the beta here. It may take a few weeks before you’re sent a download link, and installing it requires a few more steps than usual, but trust me: get this now! Dolphin Browser HD is still my web browser of choice on Android. You can get by with the default browser just fine, but Dolphin gives you lots of extra features all reminiscent of Firefox. Tabbed browsing and a host of optional plug-ins (such as speed dial, one-click tweet and save bookmarks to SD card) makes Dolphin the best browser currently available on Android. I’ve only just purchased Tasker (a snip at £3.99) but already I’m beginning to see how brilliant it is. Tasker lets you set up custom tasks to automatically control functions on your phone based on specified times, dates, locations or events. If you’ve used Locale before you’ll get the idea, but Tasker offers so much more. 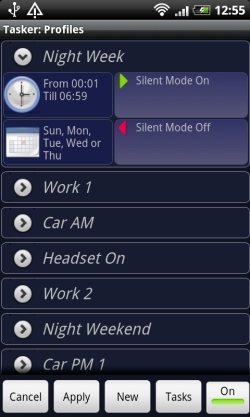 I’ve set up a few basic tasks to switch Silent Mode on and off depending on the time of day, one to enable Bluetooth when I’m in the car, and another that pops up a little Music Player select menu when I plug in my headphones. There’s so much you can do with it that it seems a little daunting at first, but the interface is very easy to use and it doesn’t take long to get the hang of it. There’s also some excellent resources where you can download and install a whole heap of pre-defined tasks and profiles. Another cheap but worthwhile purchase is Pure Calendar Widget. You can probably get by with the default calendar, but this lets you add a neat transparent widget (with heaps of size options) to show upcoming events and appointments. I still use the official Twitter app as well as HTP Peep sometimes, but I’m finding I fire up TweetDeck more and more often now to check my tweets. It’s still an early version and lacks a few features, but already does a great job of emulating the desktop version. Its main benefit is the ability to add custom columns (based on a list or search query, for example) then easily flip from column to column to read the tweets. I recently started a new job with an hour commute in the car each way. Consequently Google’s podcast app Listen has now become an essential addition to my Desire. There are thousands of podcasts out there covering every conceivable subject, from 1-minute news digests to two-hour film review programmes. With Listen you can easily subscribe to a podcast; Listen will sync it to Google Reader and automatically download new episodes for you, ready to hear when sitting in traffic the next morning. A lifesaver! This free app from Flixster is essential for all film fans. 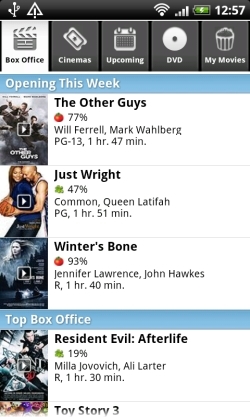 This app lists new movie releases in the cinema and on DVD, and links to local cinema showtimes so that you can easily plan a trip to the movies. It also offers trailers and film critic reviews, and there’s some nice Facebook linkage too. Movie buffs should also check out the excellent IMDb app: perfect for quick look-ups to settle “what else was he in?” arguments! Record It (and the free version called Whats On) shows UK TV listings for the next seven days in much the same way as DigiGuide does on the desktop. You can set up your favourite channels then view them all in a “What’s On Now” list or grid as well as view each channel’s schedule individually. It’ll also let you remotely record to Sky+ but I’m on Virgin cable so I don’t use that; the listings themselves were enough to make me spend a couple of quid on this. 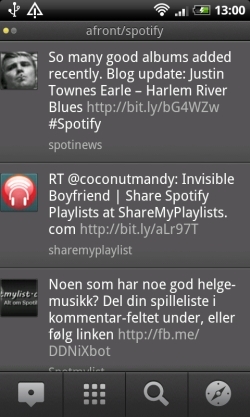 The ultimate music streaming service, Spotify on Android gives me access to over ten million songs on my phone. I strongly recommend paying the £10/month subscription for this: you know it makes sense! 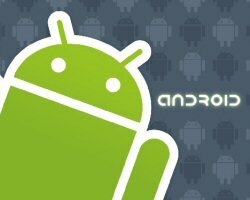 Feel free to let us know in the comments any other Android apps you think are essential!